Will taxpayers foot the bill on a federally subsidized fossil? PRICE, UTAH — Michael Milovich is a bank president, so he knows a few things about what makes a sound loan. When he looks over the financial numbers for the proposed Gooseberry Narrows Dam, he doesn’t like what he sees. "This thing gives me heartburn," says Milovich, who is also a commissioner here in Carbon County. The proposed dam would create a 17,000 acre-foot reservoir on the headwaters of the Price River near the confluence of Gooseberry Creek and Fish Creek. (An acre-foot is enough water for a family of four for a year.) The reservoir is the last vestige of a half-century-old federal program to promote small farms. Its water would be piped under the Wasatch Plateau and into the Great Basin and neighboring Sanpete County. Milovich says the dam could mean trouble for his county, which gets its drinking water from Scofield Reservoir, downstream of the proposed dam. And he believes that the U.S. Bureau of Reclamation is slanting the ledger to ensure a $24.3 million taxpayer-funded federal loan, not for the sake of Utah’s farmers, but to subsidize development in growing bedroom communities for Provo and Salt Lake City. 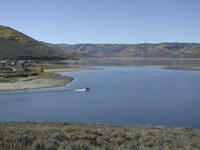 In 1956, the Bureau of Reclamation established the Small Reclamation Projects Act to help Western farmers finance dams. It was a sweet deal: Irrigation districts had to provide just 25 percent of the total price up front; the Bureau of Reclamation would loan, or even give outright, two-thirds of the remaining cost, while state governments or other financiers covered the rest. If a project was exclusively for agriculture, the federal loans were interest-free; even if it wasn’t, water users had 40 years to pay back the loan, at a highly discounted interest rate. A scathing 1991 audit by the Department of the Interior’s Inspector General found that Reclamation lost over $70 million in unrealized revenue and uncollected interest from the program. Two years later, the Bureau got out of the loan business. But the Sanpete Water Conservancy District, which has a 70-year-old water right on Gooseberry Creek, had already invested significant money in its application for the Narrows Project, starting in the 1980s. Today, Sanpete County is more desperate than ever for the water — but not because its farmers need it. Between 1990 and 2000, its population grew 40 percent, from 16,000 people to almost 23,000. Some forecasts say the population will almost double by 2020; the county already has an estimated shortage of 15,000 acre-feet of water. Sanpete County is already planning to "roll over" irrigation water from the Narrows Project so it can be used by towns. "It’s (now) a municipal-industrial need," says Bruce Blackham, Sanpete County Commissioner. "Agriculture hasn’t been flourishing." The Narrows Project has a checkered past. In 1947, the Bureau of Reclamation declared it "economically unfeasible," but Sanpete County revived the project several times, most recently with the help of the Small Reclamation Projects Act. In 1995, the Bureau signed off on an environmental impact statement that approved the project. But Carbon County and environmentalists protested that the Sanpete Water Conservancy District’s own project engineer had written the document. The Bureau rescinded its approval, citing "procedural issues," and went to work on another study; an updated version is due out later this year. Michael Milovich and other residents of Carbon County say the new study fails to address economic impacts to their county, which draws water from a reservoir downstream of Gooseberry Creek. "The Bureau of Reclamation is supposed to be a neutral party," says Milovich, "but they are an advocator and a promoter." "This is a holy war," fires back Joel Bikman, who works for a public relations firm hired by the Sanpete Water Conservancy District. Bikman says dam opponents act "almost as if the Seventh Seal (of the apocalypse) is being opened if this water project happens." Kerry Schwartz, the Bureau’s environmental impact statement coordinator for the Narrows Project, denies that his agency has any bias. Once the updated study is complete, says Schwartz, the agency will take a hard look before it decides whether the project should receive the government loan. The Narrows Project also stands to receive grants for "fish and wildlife enhancement" from the federal government and the state of Utah, despite the fact that the dam could harm endangered fish, a popular trout fishery, and stream stretches that the Forest Service has identified as eligible for Wild and Scenic River designation. Critics of the project point out that conserving water by lining existing canals to prevent leakage and updating irrigation systems — measures already included in the larger dam proposal — would provide up to three times as much as the dam itself. But Milovich isn’t optimistic that the critics will be heard: "The Bureau of Reclamation, by damn, is going to build a reservoir."